Well heck, those SUPER SMART politicians are telling us we only have 12 years! They should have chosen a later date because nothing positive can happen in that short time span, so hell, Im going to party for the next 12 years! Meanwhile the cleanup cost is currently estimated at $180 billion. Some estimates go over $200 billion. True, but Japan uses about 1B MWH per year, at a cost of 50 dollars per, ballpark figures = 50B dollars per year in current electric generation costs. To go to a carbon AND nuclear free electric grid would raise costs dramatically, and would almost certainly exceed the cost of Fukushima, every year. If you want to go carbon-free, its worth the threat of very rare meltdowns to use nuke plants. Imagine the scale of landscape which would need to be covered with turbines and solar panels to power the US, given the quantum limits to conversion % for solar for the 8 hours a day at best anywhere near nameplate capacity, plus the turbines similar limitations due to transient winds. Then, massively increase this number as people are told to use electric vehicles. The amount of energy in the cheap, easy to use, transport, and store... but evil gasoline is...34 KwH per gallon. Add 50-100 million times this number for the increase in electric load over the current system. How much land is necessary now? but evil gasoline is...34 KwH per gallon. People I know with EVs report that their "fuel" cost compared to their previous gasoline powered vehicle is maybe 1/10 -- i.e. the increase in their monthly ielectric bill is 10% compared to their prior gasoline expenditures. Of course a Nissian Leaf can't do what an F-150 can do. I think the combination of an F-150 or E-150 with an eBike is interesting. You have capable vehicle for big jobs, long trips and bad weather and thrifty, non-polluting vehicle for local errands and commuting during fair weather. Costco was recently selling an eBike for $1200 -- by my calculations this would quickly be a cost saver from reduced gasoline purchases and extended lifetime of the gasoline powered vehicle. Of course whether such a combination makes sense would depend a lot on the details of your usage. After Three Mile Island, nuclear reactors were redesigned to be fail safe. In other words, when a major failure occurs, the fire goes out. Both Fukushima and Chernobyl were old style. 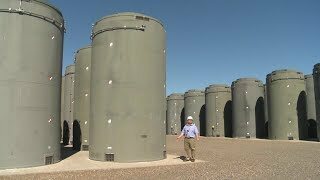 Not sure how many fail safe reactors have been built, but for newer reactors meltdowns are no longer an issue. The public often doesn't realize how transformative a high-profile incident can be for an industry and/or its regulatory overseers. Single-hull oil tankers are banned in US waters today in response to the 1989 Exxon Valdez disaster, and if you followed the Standing Rock pipeline fiasco a couple of years ago, you know that oil & gas pipeline standards are much more stringent today than they were a couple of decades back, in response to problems that became apparent under earlier rules (or lack of rules). We're fortunate to live in a country that's responsive to the safety & environmental concerns of its citizenry. Perfect....no, but you can do a lot worse. Expanding NRC's international activities to share enhanced knowledge of nuclear safety with other countries in a number of important technical areas. Hawaii is an interesting case as oil/natural gas generation costs are fairly high due to the cost of shipping said fossil fuels from the mainland. Solar with battery storage is coming in at 2/3 the cost per kwh as fossil fuel generation. As it says in the linked article, this is still a federally subsidized project, and there are likely some state incentives in the mix too although I don't have any information on that. Just saying, it would be nice to know what the true cost is without the subsidies. 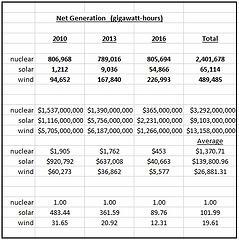 Using EIA data for federal subsidies here http://tinyurl.com/zcemsur and other EIA data on net generation here http://tinyurl.com/y5putaex we can see that in 2016, solar energy received 90 times the subsidies (federal only) that nuclear did per unit of net generation. Wind received 12 times the amount. For all three years of the subsidy report combined (2010, 2013 & 2016) solar received 102 times and wind 20 times the subsidies of nuclear energy. I'm sure the picture only gets worse when you add in state & local measures. 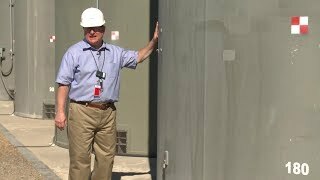 To replace the generation of Fukushima using solar panels, yearly averaged, would require covering almost the entire exclusion zone(using typical PV efficiency from 2011). Of course, by covering just roofs, you can get some electricity with no land-use loss. ~20% is a better figure, but ya, ICEs are significantly less efficient than electric motors. Including charging losses, your typical EV probably hits about 80%. Well that depends on the the location, but 10 percent is a bit of a stretch, unless they simultaneously downgraded from some massive gas hog. Washington state is one of the best places for EVs(thanks Columbia river dams!). Using our numbers of 3 dollar gas and 10 cent KWHe... an EV has about 4, maybe 5x cheaper fuel than a gasoline vehicle of similar size. But plug in 2.50 gas and 22cent electricity in Massachusetts... and the EV is down to only a slight edge. It's not the politicians saying that, it is your mother, mother nature. Global net human-caused emissions of carbon dioxide (CO2) would need to fall by about 45 percent from 2010 levels by 2030, reaching ‘net zero’ around 2050. But please do enjoy your party. You should invite us all. Interesting article about solar energy ROI. Sounds about right... the panels themselves are more mature tech than the batteries. Too much text and links to click here on this page I barely skimmed it. No way im thumbin' thru just to "catch up"!!! But this is the real deal folks. lets just say the lord is more in the taketh away phase of his deal if ya know what I mean. The world's youth have begun to persistently demonstrate for the protection of the climate and other foundations of human well-being. (1, 2). As scientists and scholars who have recently initiated similar letters of support in our countries, we call for our colleagues across all disciplines and from the entire world to support these young climate protesters (3). We declare: Their concerns are justified and supported by the best available science. The current measures for protecting the climate and biosphere are deeply inadequate. Nearly every country has signed and ratified the Paris Agreement of 2015, committing under international law to hold global warming well below 2°C above preindustrial levels and to pursue efforts to limit the temperature increase to 1.5°C (4). The scientific community has clearly concluded that a global warming of 2°C instead of 1.5°C would substantially increase climate-related impacts and the risk of some becoming irreversible (5). Moreover, given the uneven distribution of most impacts, 2°C of warming would further exacerbate existing global inequalities (5). It is critical to immediately begin a rapid reduction in CO2 and other greenhouse gas emissions. The degree of climate crisis that humanity will experience in the future will be determined by our cumulative emissions; rapid reduction now will limit the damage. For example, the Intergovernmental Panel on Climate Change (IPCC) has recently assessed that halving CO2 emissions by 2030 (relative to 2010 levels) and globally achieving net-zero CO2 emissions by 2050 (as well as strong reductions in other greenhouse gases) would allow a 50% chance of staying below 1.5°C of warming (5). Considering that industrialized countries produced more of and benefited more from previous emissions, they have an ethical responsibility to achieve this transition more quickly than the world as a whole (4, 6). Many social, technological, and nature-based solutions already exist. The young protesters rightfully demand that these solutions be used to achieve a sustainable society (7). Without bold and focused action, their future is in critical danger. There is no time to wait until they are in power. Politicians have the huge responsibility of creating the necessary framework conditions in a timely manner. Policies are needed to make climate-friendly and sustainable action simple and cost-effective and make climate-damaging action unattractive and expensive. Examples include effective CO2 prices and regulations; cessation of subsidies for climate-damaging actions and products; efficiency standards; social innovations; and massive, directed investment in solutions such as renewable energy, cross-sector electrification, public transport infrastructure, and demand reduction. A socially fair distribution of the costs and benefits of climate action will require deliberate attention, but it is both possible and essential (8). The enormous grassroots mobilization (2) of the youth climate movement—including Fridays for Future, School (or Youth) Strike 4 Climate, Youth for (or 4) Climate, and Youth Climate Strike (7)—shows that young people understand the situation. We approve and support their demand for rapid and forceful action. We see it as our social, ethical, and scholarly responsibility to state in no uncertain terms: Only if humanity acts quickly and resolutely can we limit global warming, halt the ongoing mass extinction of animal and plant species, and preserve the natural basis for the food supply and well-being of present and future generations. This is what the young people want to achieve. They deserve our respect and full support.